Amy of Literary Lacquers creates a special polish each year to celebrate her birthday. 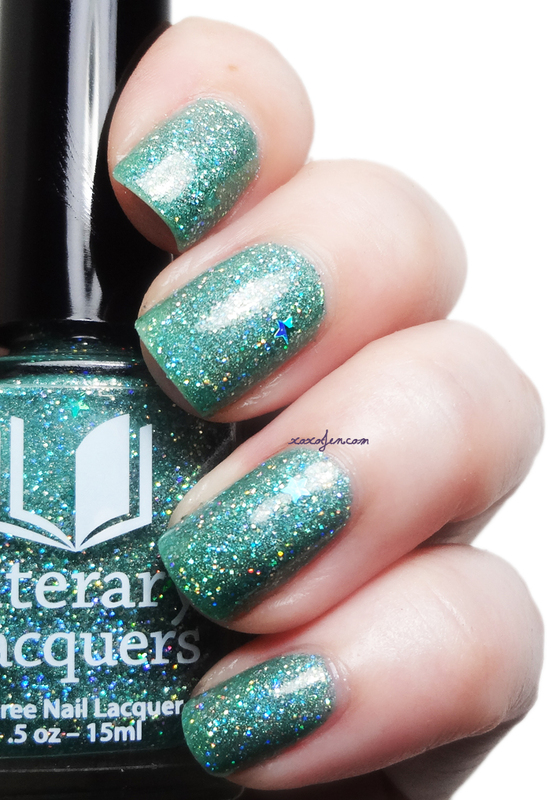 The numbered limited edition polish this year features tiny stars and holographic glittery goodness in a sea foamy green jelly-ish base. The literary inspiration comes from the book Hitchhiker's Guide to the Galaxy by Douglas Adams and is named: The Ultimate Answer. If you've read the book, you'll know what the "answer" is which just happens to match Amy's birthday. Clever, eh? Absolutely beautiful polish which is quite reminiscent of a previous Disney LE duo she did, maybe they're cousins?! Application is smooth and easy to control as with all other LitLaqs I've worn. I used two coats with topcoat, and I tend to be a little heavy handed. If using thinner coats, three may be necessary. The stars are both silver and green and are subtle and few on purpose - those on my nails are what I got without any fancy dipping. To get more stars, check this helpful guide on glitter fishing for various techniques. The Ultimate Answer will be available for preorder at the Etsy shop at 1pm central Friday August 28th - 1am central Monday August 31st. Isn't it though? Thanks for commenting!